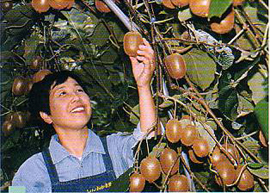 A female farm owner checks a kiwi fruit. Photo Courtesy of Ito Agricultural Extension Center. In Japan, where small family farms have been dominant, women have traditionally been major participants in agriculture. As the number of farmfamilies whose members worked in other jobs increased, women took on more of the burden of family farming. As the term “san-chan nōgyō” indicates, the operation of farms shifted to a pattern in which the father of the family works at a company, while the grandfather, grandmother and the mother all farm. Women are often reluctant to marry into a farming household because they dislike the heavy farm work, and because of the conservative social relationships in rural areas. For many farming villages, a shortage of brides has become a serious problem.On the other hand, as mechanization has lightened the burden of farm work and as the computer and Internet have spread to rural areas, more and more women are starting new businesses using local agricultural products. Click CHART to see the shift in entrepreneurship among rural women.